Lowe dealers received good news this week when the announcement of a 2019 model was released. The new SF 232 WT is sure to end up on the wish list of many anglers this holiday season and just like the SF 212 WT, the new SF 232 WT combines all the amenities for a fun-filled day on the water. It has a spacious and convenient walk-thru layout and counting the fishing seats in the bow, there’s plenty of comfortable seating throughout, including dual rear-facing loungers in the stern. Consumers are able to choose from several factory-installed MotorGuide® trolling motor and Lowrance® fishfinder options, while a heavy-duty Bimini top will provide welcome shade. Lowe developed an innovative fishing layout using a walk-thru aft-to-bow design with a mirrored furniture concept for a true symmetrical look. The new model uses existing fence concepts and SF features, plus a bow fishing layout (rod box, livewell, and battery box) was developed that anglers are going to love! Other noteworthy features include standard vertical rod holder storage with tackle box on port fence and an option to upgrade the bow fishing seats to a 23-inch helm seat or 29-inch recliners. Offered in two log or TL packages and available with tan or gray interiors with all the fence color options that are available in the SF lineup, the new SF 232 WT allows you to customize your pontoon to fit your specific needs. 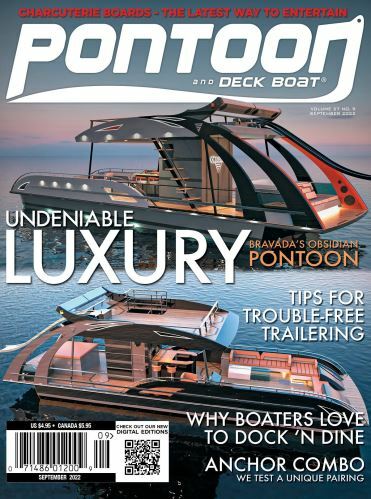 For more information on the complete Lowe lineup of pontoons click here.